While Sasha and Malia were behind the scenes playing director and producer in This Week’s control room, Barack Obama told This Week’s host George Stephanopoulos that they’ve narrowed the search for his family’s puppy. 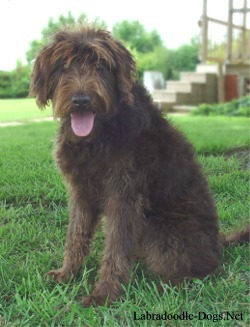 The first dog will be a Labradoodle or a Portuguese Water Dog. These two dogs made the short list because they don’t shed, and Malia the Obama’s eldest child has allergies. The Obama’s are looking for a non-allergenic dog which doesn’t exist . Although a dog that doesn’t shed is a plus for someone with allergies; it’s the protein in the saliva that people can be allergic to. According to CNN’s Up Close segment of the Anderson Cooper show the reason that the AKA is hoping that the First Dog will be a Portuguese Water Dog is that it’s a recognized breed and the Labradoodle isn’t. Not a very good reason for choosing a dog. Dr. Debbye Turner Bell( the resident veterinarian on CBS’s The Early Show) said that the Portuguese Water Dog is a working dog that needs a job and a lot of activity. They need to work and exercise or they can be a handful. She’s not sure it’s the best choice for a family that are first time dog owners. The American Kennel Club describes the Portuguese Water Dog to be a dog that is resistant to fatique. 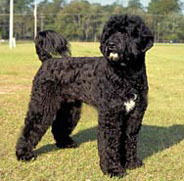 The Portuguese Water Dog is an intelligent, rugged, and robust dog who loves to work outdoors. These dogs needs people. He thrives as a member of the family and will prove himself to be trustworthy. He is an energetic dog who loves to be the center of attention. Known for centuries along Portugal’s coast, this seafaring breed was prized by fishermen for a spirited, yet obedient nature, and a robust, medium build that allowed for a full day’s work in and out of the water. The Portuguese Water Dog is a swimmer and diver of exceptional ability and stamina, who aided his master at sea by retrieving broken nets, herding schools of fish, and carrying messages between boats and to shore. He is a loyal companion and alert guard. Like most Labrador Retrievers and Poodles, Labradoodles are generally friendly, energetic and good with families and children (although as with any dog the temperament may vary between individuals). Labradoodles also often display an affinity for water and the strong swimming ability present in both their parent breeds. Like their parent breeds, both of which are amongst the world’s most intelligent dog breeds. Labradoodles are very intelligent and quite trainable. Labradoodles can be taught to obey verbal or sign language commands, or both, and remain commonly used as guide dogs for disabled or handicapped persons around the world. Although most Labradoodles are healthy, they can suffer from certain problems common to their parent breeds. Dr. Bell seems to favour the labradoodle which has the gentleness of a labrador and the intelligence of the poodle. “Reinforce the behavior you want rather than punishing what you don’t want”. Families getting their first dog should go for the best temperament, size and predictability, and wait until they have experience before getting a rescued dog. If choosing from a litter, pick the middle dog: Don’t pick a puppy too dominant or one who’s hanging back. Regardless of the dog’s age or its breed, it’s going to take some work to get it to fit in. There is nothing morally better or worse about getting a dog from a shelter vs. a reputable breeder. Get the right dog for you. With a rescue dog, go in with your eyes open and be realistic about your ability to cope with behavioral issues. If looking for a certain breed, contact the breed organization for breeders’ names. Call several and ask them to identify a few other good breeders. Bo loves tomatoes and playing ball in the middle of the night. At the moment he doesn’t know how to swim; he has to be taught;but according to the AKC he will become a swimmer and diver of exceptional ability and stamina.